“This book for early readers is charming…. I liked the big brother, big sister story here. Liam is a good big brother, patient and caring. I also liked how the adults didn’t fit stereotypes. “A cute story that teaches children about patience. It’s especially perfect for parents to read to their small (only) child when there’s another on the way. Carmen Mok does a wonderful job with the illustrations and I love the color palette she chose…. “Author Sarah Ellis has written a sweet story that will help youngsters understand the process of becoming an older sibling and how much patience is needed. This is not a typical picture book but is more like an early reader with quite a bit of text. “…Liam loves to play with little Sophie, and everyone says that he is her favourite person. However, even after three weeks, Sophie is still just lying in her crib. 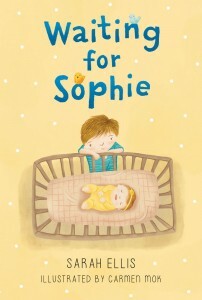 It is taking much too long for little Sophie to grow up and to be able to play with him….How will Liam learn to cope? This is a beautifully written chapter book about the relationship between Liam and his new baby sister Sophie….Young Liam is an appealing character who loves his little sister, but definitely wants her to grow up quickly so that she will not break his toys, and will be able to play with him. Throughout the story, Liam learns how to love his sister, but more importantly, learns how to be more patient with her. The illustrations are colourful and filled with lots of detail which adds to the narrative….This is a gentle story which will definitely appeal to young readers with siblings, as well as the adults who care for them! “Waiting can be so hard for little ones, especially when it’s for a baby sister who is taking her time being born and growing up so you can play with her. And this waiting is just about killing little Liam…. Sarah Ellis gives Liam a voice that is so filled with hope about his new sister and the promise of having a familial playmate that even his frustrations are natural and unfeigned. He speaks with his heart, never with meanness or anger, though he acknowledges the annoyance of biding his time. Sophie has a great big brother. And, although Waiting for Sophie is an early reader, rather than a picture book, the illustrations by Carmen Mok augment Sarah Ellis’ story with the innocence and family that the author’s words already convey.